Released in August by the NZ Environmental Protection Agency is the 2014 Facts and Figures report summarising actions of the Emissions Trading Scheme for the period 1 January 2014 to 31 December 2014, as well as the longer annual report under section 89 and section 178A of the Climate Change Response Act 2002 for the period 1 July 2014 to 30 June 2015. These reports are released each year allowing comparisons to be made. The quantum of the surrender from all sectors in 2014 was 29.8 million, compared to 45.5 million in 2013 and 26.9 million in 2012. This decrease in surrender for 2014 can be attributed largely to the legislative change in May 2014 that immediately excluded forest owners the opportunity to surrender international units when de-registering post-1989 forest land (arbitrage). Only 3% of the 2014 surrender was met using NZUs. In 2013 only 0.5% of the surrender was met using NZUs. It is possible that the increase in surrender of NZUs for 2014 may have been due to the May 2014 overnight legislative change, forcing foresters to surrender de-registration liabilities using NZUs. The remaining 97% of surrender in 2014 was met using ERUs, CERs and RMUs. 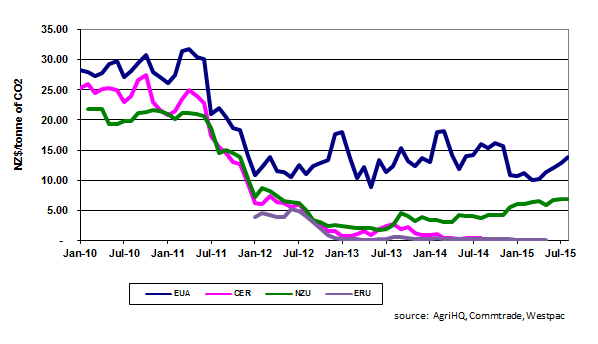 ERU price averaged around $0.20 per unit over the 2014 year, compared to an average price for NZUs of around $4.00. ERUs are mostly generated in Ukraine and Russia and have been known as “hot air” units, due to the dubious environmental integrity of the units. Note that these Kyoto units are no longer eligible for surrender in the NZ ETS by any sector. The total emissions reported in 2014 were 83.0 million tonnes, so only 35% of our total emissions resulted in a surrender of units in 2014 (29.8 million). Agriculture is included in the reported emissions but farmers have no requirement to surrender any NZUs. The transport and energy sectors currently surrender 1 unit for every 2 tonnes of carbon emitted. Large industrial emitters receive allocations of NZUs from the government, making them liable for only 5% of their annual emissions. These policy settings of the ETS and dubious environmental integrity of the main unit of surrender to date (ERUs) suggest that the net effect of the New Zealand contribution to global emissions reduction has been less than expected. There is significant scope for improvement of the NZ ETS. We will need to wait for the outcome of the of United Nations Framework Convention on Climate Change (UNFCCC) international climate conference to be held in Paris this December to find out what commitments New Zealand will make. The outcome of this conference will also impact on the ETS review scheduled to commence in 2015. The timing of this review has not been announced. Prices remained flat over the last month, the NZU market continues to trade on low volumes around $6.70- $6.80 per NZU, weakening to $6.60 in the last few days. The figure below shows the recent carbon credit prices for EUAs, CERs, NZUs and ERUs. Note that from 1st June 2015 only NZUs or New Zealand AAUs are valid units in the NZ ETS. EUAs are valid units for trading within the European Union.